Community builders have always talked about burnout: the feeling that you have a million things to do but cannot seem to find the will to do any of them, that you will never get “enough” done, and that you no longer find joy in the work that once got your heart pumping. At Community Leadership Summit, the session on Impostor Syndrome and burnout was the largest and the most talked-about of the entire weekend. Burnout is often the result of unclear direction and an avalanche of expectations, and it is an epidemic among community professionals. We have to do something about it. If you are noticing that you work all the time or feel anxious about not doing more, burnout may be just around the corner. Let’s stop it in its tracks. Your personal sense of productivity is closely tied to feelings of burnout. When you feel that you are giving all you can, you begin to see your value. But when you’re working with no productivity system in place, it’s easy for Impostor Syndrome to get the best of you: are you doing enough? Are you spending too much time on Twitter? Does everyone think you’re just making everything up? 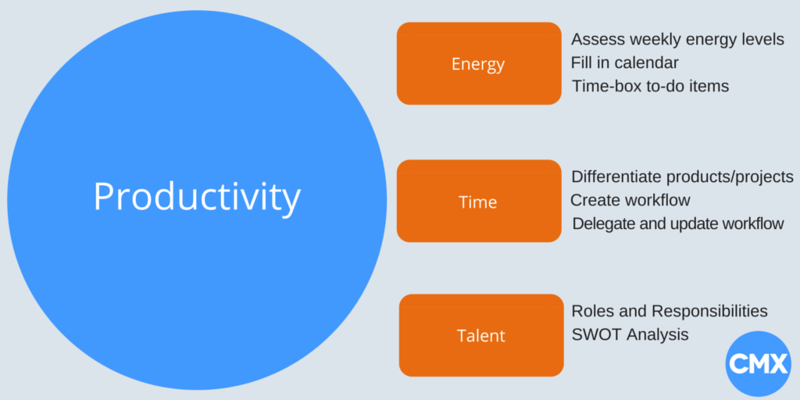 Productivity is not just about getting things done. It’s about getting them done in a way that is sustainable over the long term. Here, we will show you how to assess your productivity and pick tools that allow you to work in your own most productive way. There is no one-size-fits-all solution to community productivity. Instead, we offer a different way of looking at productivity, bolstered by advice from our in-house productivity expert, Robin Spinks, and dozens of our CMX community members. Last week, Susan Silver prompted a lively discussion in our community about organizational tools for community professionals. We received dozens of recommendations for community tools, and we were tempted to write this article about which tools to use and why. But the hard truth is that tools alone will not make you more productive or successful in your role. Tools combined with a personalized strategy for productivity will prevent you from burning out, which paves the road to long-term community success. Imagine feeling at ease because you have a clear productivity strategy, being able to demonstrate your chops as a community professional, getting that first really big community win under your belt, and asking for bigger budget next year (or just getting one without having to ask…). This is what a clear productivity strategy can do for you. Let’s take a step back and break “productivity” into three parts. At CMX, we started working with our operations expert, Robin Spinks (yes, related to CMX CEO David Spinks), who has built educational strategies for some of the world’s largest companies like BP and UK’s National Health Service. Robin has helped us redefine our own productivity, just as he has done at these large organizations. Energy: Don’t get caught doing a string of arbitrary tasks. Plan your time to become more efficient in how you use your energy. Time: It is your most valuable resource. Make it worthwhile and productive. Talent: Play to your individual and team strengths. We’re not going to pretend that we can give you “10 Life Hacks to Become More Productive as a Community Manager.” Rather, your productivity strategy is a deeply personal function of how these three factors play out in your life and work. Below, we discuss each of these three factors and how you can start using our community members’ recommended tools turn your day into one that is more productive – and keeping yourself from burning out. It’s really about making a series of well-informed decisions and knowing yourself, and using tools to act on those decisions. Knowing how you want to spend your time, energy, and talent – and when and where – is how you become more productive. Burnout zaps you of your energy. You could be going 100 miles per hour and burnout will slow you down to a snail’s pace. So before you get to that point (or if you’re already there, it’s not too late! ): take a long look in the mirror. If you can be honest with yourself about when you work best, you’ll be able to schedule your time in the most effective way. Figure out which times during the day you are the most productive, and then use tools that allow you to fit your most critical pieces of your workflow into those times. These pieces must be critical for you as well as for your organization. We recommend tracking your non-meeting time for a week before moving forward full-speed. CMX member and consultant Lauren Girardin recommends Toggl for time-tracking, and you can begin to use it track your time for an entire week. Pay close attention to the times when you can work uninterrupted. If you find that you can work on a task nonstop for 90 minutes at 8AM before the office gets filled with noise and people, you’ve found a productivity peak. If you find that you surf Facebook every 15 minutes at 3PM (I personally recommend News Feed Eradicator for you…), that’s a productivity trough. Batch mindless tasks together for those times. During peak times, give yourself space to finish tasks that require strategic thinking and those that will impact your organization the most. Try to avoid, at all costs, scheduling meetings during those times. If you block it off in your calendar consistently, people will stop scheduling meetings with you at those times. Besides assessing your time, consider your location. It’s easy to discount your location while you work, but location subtly influences your mood and your ability to focus. When you go to coffee shops, do you find it easier to write? When you block off a conference room, does it take a shorter amount of time to get through some heavy data analysis? Honor what fits your energy levels. A study from USC shared that distractions, air quality, and lighting are the most important factors to consider when picking a good workspace. Kicking up your energy requires planning. That means it’s time to find the right tools to optimize your energy at all points during the day. Alas, your calendar is where all this begins. No matter how well tended you think your calendar is, take a moment to re-evaluate your current calendar. “My calendar is the lifeblood of my work. It keeps me on track, so it should be organized at all times,” says CMX Content Strategist Clem Auyeung. Dave Fontenot, founder of HackMatch, echoes this same sentiment: “I live on Google Calendar.” Whatever your tool of choice (be it Google Calendar, Outlook, a giant dry-erase calendar, or Sunrise), your calendar is the shining beacon that will always guide you back to productivity’s shore. Robin Spinks shares three key tips for re-evaluating your calendar. Your calendar is what sets the tone for your day, and it can make or break you. Most calendars have a task list function – that’s because they recognize the difference between actual events that should be put in your calendar and a list of things that must be done. Similarly, your to-do list (whichever app you use, be it Outlook tools, Asana, Trello, etc. ), is key to your success. In an ideal world, your calendar and to-do list will link together and integrate with your team communication tool (i.e. Asana integrates with Slack and Gmail). But be wary of using your calendar and to-do list the same way. The minute you start putting to-do items on your calendar is the minute your calendar becomes less useful. And when you don’t complete those items in the scheduled time, you’ll get discouraged. ToDoist Integrates with Gmail and is recommended by CMX Members Paula Rosenberg, Cosette Paneque, Melanie Spatola, and Brittany Berger. Timeboxing is the act of setting aside a window of time to complete tasks when you know you’ll be most productive. So take your tasks that require the most energy and do them when you have the clearest mind and the most energy (for example, Tuesday mornings rather than Friday afternoons). 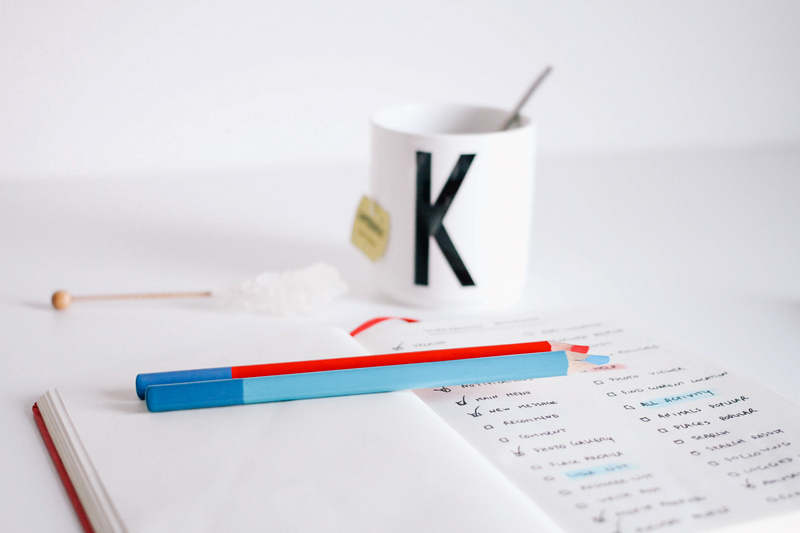 Consider timeboxing your personal time too. There are some days where you will need a long walk at lunch to recharge. Put that in your calendar. Your self-care time is non-optional. Knowing this is key to avoiding burnout because you are at your most productive when you have taken care of your own needs. Mind-mapping can be a great way of setting up your task list from the get-go. It allows you to assess what is urgent, important, what is being roadblocked, and what you have completed. From your mind-map, you can begin to input blocks of time in your calendar to do the work on your task list. Lifehack gives a full tutorial on how this works. This is something you can do both online with free tools like XMind as well as on paper, like many CMXers prefer. “I have a paper planner that I use for the most important items — in the calendar part, deadlines and appointments that are crucial. And in the agenda portion, I’ll list three or so of the most important projects for the day,” says Brittany Berger, Content and PR Manager at mention. Other community professionals suggested tools like TeuxDeux (created by CMX Speaker and member Tina Roth Eisenberg), Wunderlist, Any.do, Workflowy, and ToDoist. In addition to timeboxing intense writing time, I timebox yoga classes, dog park breaks, and coffee chats with fellow community professionals (I guess these are work, but they don’t feel like it!). When it’s in your calendar, you no longer feel guilty about doing it. You just know that it’s part of your day. This step helps you figure out how to make your time work with everyone else’s – both your team and your community’s. A lot of your time at work is not free to schedule as you wish. So now you have to work with the eight hours you have at work in a day (working more than that on a regular basis is a one-way ticket to burnout city). Here, you will decide when you’ll do something, how you’ll do something, and with whom you’ll do something. This is where formal processes will help you keep on top of every single one of your community products. Robin Spinks helped us discriminate between products and projects. This is a crucial distinction because it will determine what you should actually spend your time doing. Products are far more important to streamline. Once you’ve streamlined them, you can move on to projects. Not a moment sooner. Product: The actual products your organization provides to its customers e.g. an e-book you’ve created, a mobile app, a forum space that has already been launched. A product is part of your day-to-day operations as a company. The opposite of a product is a project. Project: A project is NOT part of your daily operation. The purpose of a project is to create a Product/Service that will – on the completion of the project – become part of your daily operation. Projects are temporary endeavors to create some unique deliverable or end result, i.e. product or service. They are not “business as usual”. Therefore, the activities and skill sets required may be different from your normal working practice. Projects are an endeavor. They are intentional and planned events, not spontaneous. Projects create a unique product or service. Before we dedicate time to making a half-baked project into a product, it’s best to work out its priority and then develop a workflow for it. To assess priority, we go through a simple spreadsheet where we rate (from 1-3) how the potential project may affect our reputation and how it will impact the business bottom line. If we find that a project has a high potential to do both, we run with it. If not, we hold off. Then we begin to map out a process. We begin by breaking the project down into individual steps, what they require, and who will own which parts. Once you decide to move forward turning a project into a product, it’s time to write a clear-cut strategy. That means actually sitting down and writing out all the steps in your process and who will own them. That sounds like a lot of work, but once it is in place, you can begin to refine the process as well as delegate it to others (once you’re more productive and effective, your team is going to grow… but get ready for it). 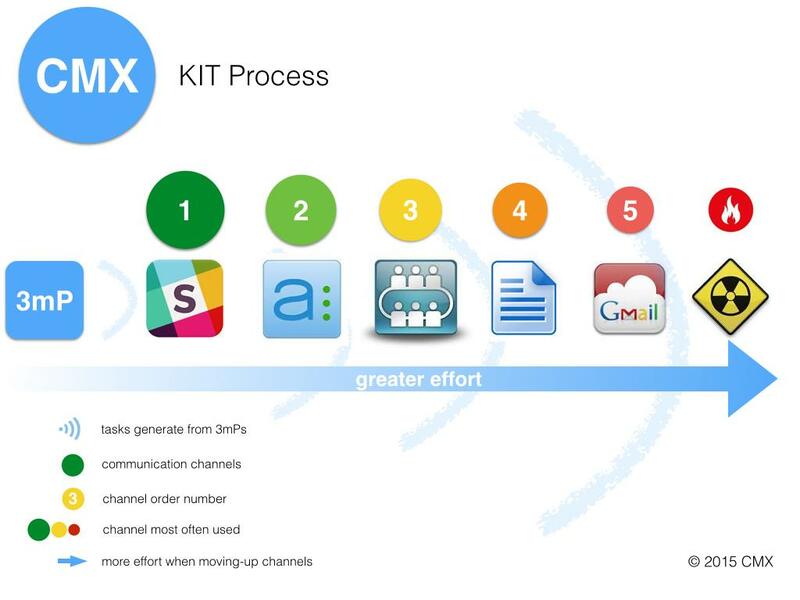 Here’s an example of how to map out a new process, inspired by Meghan Casey’s Content Strategy Toolkit. You can do this all manually in a Google Sheet or task management software like ToDoist, Asana, Trello that your team has access to. In the early stages, we recommend mapping things out in charts first, and then going straight to the software. Once we have decided on the process, we input every single task into Asana and assign it to the appropriate team member. From there, you can use Instagantt to visualize an entire project setup or product process. Task management tools are essential, especially for larger teams who cannot spend their days communicating face-to-face. Having a tool like Basecamp, Trello, or Asana keeps everyone on your team accountable. As mentioned above, these tools can also help you visualize the work you have to do. Whether you’re a solo community warrior team of one or you’re part of a team that may already be using a tool, your tools should work with the rest of your organization’s tools. If the rest of your team uses Trello, use Trello too. It’s not a great idea to go off and be intrepid. You really could do all of the above planning within a great task management app and end up with a visual representation of the products at hand and your own role in them. Then you could go about boxing off time in your calendar for those items and throwing in an hour for a lunch break in the park too. Being productive also means respecting other people’s most productive times. At CMX, we have a full-fledged “Keep In Touch” strategy among our team members. It formalizes our internal processes, in which we have decided never to use e-mail as an internal communication tool. We know how distracting it can be, and we also know what a mess our inboxes can get. This strategy saves us enormous amounts of time and keeps our inboxes uncluttered. We go from Slack to Asana to meetings to Google Docs before we even begin to go near our e-mail. Again, these communication tools must be streamlined across your team so that you can integrate the tools you use, easily delegate and update others on project status, and respect each others’ time. No matter the size of your company, communicating your status, roadblocks, and comments in a clear way will keep you from burning out over the long-term. Many community builders start to burn out when they begin to feel isolated and alone in their work. Communication tools prevent this issue from growing larger over time. Imagine your true strengths lie in your ability to build trust and relationships with others, but your manager has you crunching numbers all day. There is no quicker way to crush a community professional’s spirit than to ignore the talents that brought them to the role in the first place. That’s why it is so important to know your own talents as well as the talents of those on your team so that you can play to everyone’s strengths. When you focus on things that energize you, you do higher-quality work – faster. When you are saddled with tasks that are constantly draining, it will soon lead to burnout. To prevent burnout, find your strengths and weaknesses, and then clearly define roles on the team, including who is responsible for each piece in the process (the one you created above). First things first: Ask yourself if you have a centralized community team, a decentralized community team embedded into other departments, or a mix of both? Or are you a team of one? 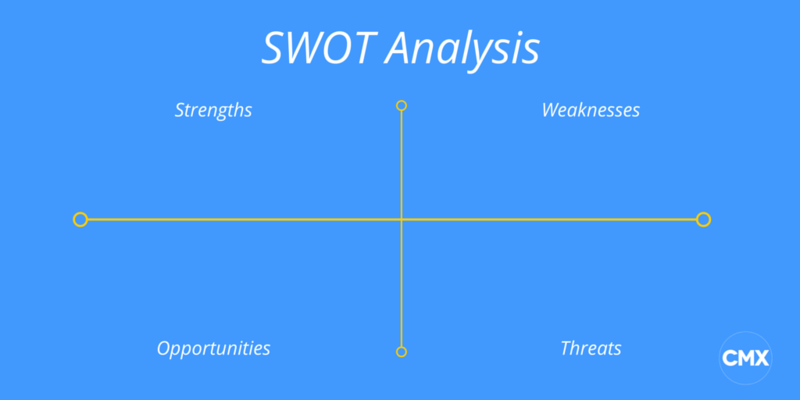 You’ll want to run through a SWOT Analysis to identify your team (and personal) strengths, weaknesses, opportunities, and threats. Then match individuals with the roles that make most sense for them. Play to your strengths. If you’re not good at design, for instance, it may be time to hire a freelancer to help design the look and feel of your community forums or guidelines. If you’re not good at creating processes, it may be time to either brush up on those skills or bring in someone higher-up to help you formalize the work you do. There is no faster way to burn out than to continually do work that does not play to your strengths. Once you create processes, defining roles and responsibilities becomes much easier. And now that you know your own strengths and weaknesses, you know where you might need help. At startups especially, people assume that everyone knows their roles and responsibilities, but nothing could be further from the truth. It may be time to crystallize yours. If you are still confused about your role and the roles of others on your team, it’s time to bring this problem to your manager and start to define where you fit in. Unless you are the manager, don’t attempt to solve this yourself. As you begin to use each of these tools and create a strategy based on what works best for you, you will want to distill insights from them all into one central place. Your overarching strategy will contain the three elements and an action plan for how best to approach all of them. For any areas you own, create an accessible dashboard for status updates, measurement, and tracking of all the moving parts. Without keeping track of your own productivity, how would you prove the value of your work when it comes time to ask for a bigger budget? This is where all of your tools will begin to form a system, from coming up with project ideas to measurement, to forming a roadmap for your strategy. A tool like Asana or Trello combined with a Google Sheet Dashboard of project updates is ideal here, depending on your organization’s preferences around tools. Either way, having a final dashboard with weekly metrics, progress, and status updates that your team can access will build trust among your team that will give you greater freedom to continue to spend your time in the way that works best for you. All of this work will help you level up as a community professional when you create a full-fledged process as well as a place to measure the efficacy of that process. This is the kind of work that the C-Suite can identify as effective and measurable, and it’s the kind of work that will not only keep you healthy but will get you promoted. Of course, workflows can be tweaked and changed over time. In fact, as you work through your process, you may find that some of these tools are no longer necessary. How is that possible? The better you get at your work, the more you can identify problems in your process that can be fixed. Everyone has their own system, and no one system is better than another — unless one is overwhelming you and burning you out. What does your system entail? 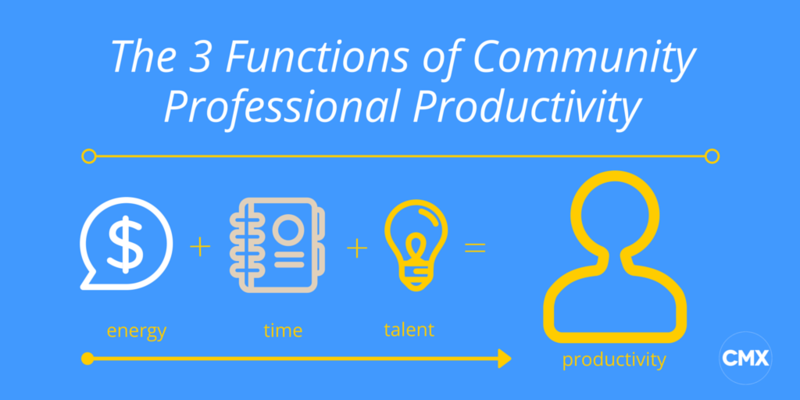 We’d love to hear about your personal productivity framework in our discussion here.